Hezbollah Suspect May Face U.S. Military Commission To date, U.S. military tribunals have been reserved for al-Qaida and Taliban suspects. But now the Obama administration is seeking to try a Lebanese man accused of orchestrating the killings of five American soldiers in Iraq. U.S. Brig. Gen. Kevin Bergner speaks in Baghdad in July 2007 near a poster of Ali Musa Daqduq. Daqduq was captured in Iraq in March 2007, and is accused of orchestrating the killings of five U.S. soldiers. The U.S. left Daqduq in Iraqi custody when U.S. troops formally withdrew in December. But the Obama administration is seeking to try him before a military commission. The Obama administration is seeking to try a Lebanese man linked to Hezbollah in a military commission, expanding the reach of the military tribunal beyond al-Qaida and Taliban suspects for the first time. The man at the center of the case is Ali Musa Daqduq. He was the last detainee held by American forces in Iraq and had been turned over to Iraqi custody when U.S. forces formally withdrew from Iraq in December. Daqduq is accused of helping to train insurgents in the use of roadside bombs, and allegedly helped organize a raid in January 2007 that killed five American soldiers and wounded three others. Apparently the insurgents wore American-style uniforms and carried forged identity cards to get close enough to the U.S. soldiers to kill them. Daqduq was captured a short time later and allegedly confessed to the crimes. He had not, apparently, been subjected to any harsh interrogation techniques when he admitted to being part of the plot. News of the effort to resolve the Daqduq case in a military tribunal was first reported by the New York Times. 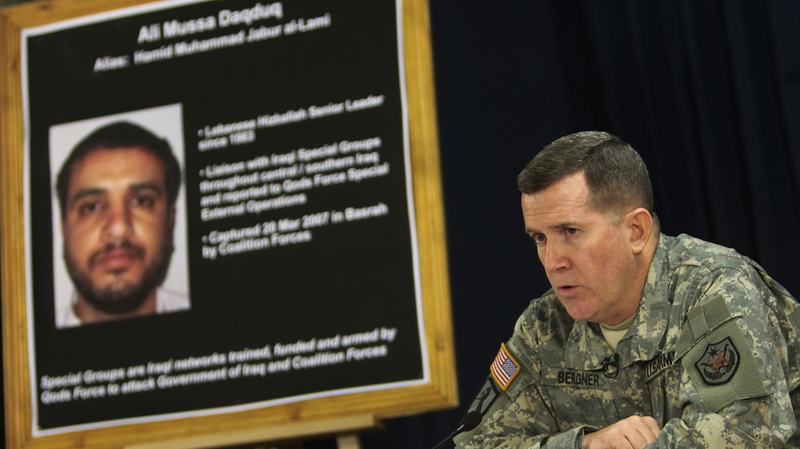 "Due to the president's concerns about the crimes Daqduq is alleged to have committed, we are working with Iraq to effect Daqduq's transfer to a U.S. military commission consistent with U.S. and Iraqi law," said Lt. Col. Todd Breasseale. "We are seeking the fastest possible way to bring him to justice." But officials close to the process tell NPR that the effort to bring Daqduq to a military commission is in the earliest stages. No doubt this is a very special case. While a prosecutor has drawn up the charges, the chief prosecutor at the military commissions, Gen. Mark Martins, has yet to approve them. Once those charges are approved by the chief prosecutor, they are then forwarded to a convening authority who makes an independent determination as to whether to refer the charges for trial. Nothing beyond the drawing up of charges has happened yet. Officials familiar with the process tell NPR that the Daqduq charges will likely stay in Martins' office until there is some sort of resolution about whether Daqduq will be extradited to the U.S. or, more likely, taken to a third country to stand trial before a military commission. Military commissions, by design, can be convened anywhere. They do not necessarily have to take place at the naval base in Guantanamo Bay, Cuba. Breasseale said that there are multiple charges against Daqduq, including murder in violation of the law of war, attempted taking of hostages, perfidy, spying and terrorism. The Daqduq case has been a special one for the U.S. for a number of reasons. He was the last prisoner held by U.S. forces in Iraq, and U.S. officials were concerned that he might be released or returned to Iran if he was left in Iraqi hands. Under an agreement with the Bush administration, however, the Iraq government controlled decisions about prisoners like Daqduq. Late last year, during negotiations about prisoners, Prime Minister Nouri al-Maliki refused to allow the U.S. to remove Daqduq from Iraq summarily. The Iraqi leader said he would consider handing over Daqduq to the Americans if formal legal processes are followed. The preliminary charges appear to be part of an effort to do that. "No doubt this is a very special case," said Matthew Waxman, who was a senior policy adviser on detainee affairs in the Bush administration and is now a professor at Columbia Law School. "And the administration will go to great pains to say this is not an expansion. However, having worked in this area for a while, I've come to learn that there will always be other special cases."